Our generation's greatest performer on the MET stage showcases her finest performances in one collection. Live At The Met features excerpts from live performances on the Met stage from La Boheme, Don Giovanni, War &Peace, I Puritani, Les Contes d'Hoffmann (The Tales of Hoffmann), Romeo etJuliette, Don Pasquale and Lucia di Lammermoor. 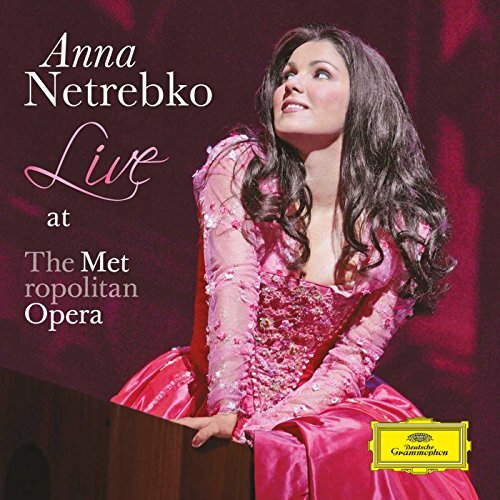 Anna Netrebko Live at the Metropolitan Opera is Anna's first live solo album on CD.The selections - including performances with tenors Roberto Alagna, Joseph Calleja and Juan Diego Flórez - demonstrate Anna Netrebko's remarkable vocal range and dramatic imagination. All recorded live, they are infused with her unique vocal magnetism and irresistible on-stage charisma.